Cotton Designer Long Length Kurtis Manufacturers, Wholesaler, Suppliers in Sitapura Industrial Area, Sanganer, Jaipur. Since our inception, we are engaged in manufacturing and wholesaling a wide range of Designer Pakistani Embroidered Long Length Kurta. Our offered mesmerizing collection is designed with perfection in different sizes, patterns, colors and designs, under the guidance of tailors and designers. Can be worn in marriages and birthday parties, these kurtis can be customized as per the specific demands. Since our inception, we are engaged in manufacturing and wholesaling a wide range of Designer Pakistani Long Length Kurtis. Our offered mesmerizing collection is designed with perfection in different sizes, patterns, colors and designs, under the guidance of tailors and designers. 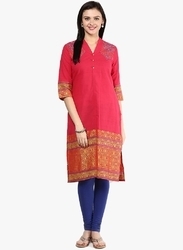 Can be worn in marriages and birthday parties, these kurtis can be customized as per the specific demands.